One of the biggest questions an investor may have after investing in gold bullion coins such as Krugerrands or Gold Sovereigns is where to keep it. The plus side is that there are many options available for investors large and small. Some of the best options are to store your gold coins in gold storage boxes, or in a vault. Here you can find some information on different options available for storing your gold and keeping it secure. Gold storage boxes, or safety deposit boxes, can be a good option if you have decided to invest in gold coins. If you have only bought a few coins and do not believe your purchase “large enough” to store in a vault, a safety deposit box at a bank could be the perfect solution. Since deposit boxes can be quite small, and cheaper, than other options, it is up to you what you place in them. You may decide to just keep your new gold coins in the safety deposit box, or you may place some precious family heirlooms in it as well. Whatever you decide, safety deposit boxes can be a good option for smaller investors, as they are secure, cheaper, and easily accessible. 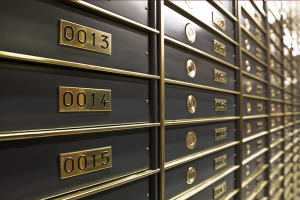 One thing to keep in mind, however, is that banks generally do not insure the contents of safety deposit boxes, as they are unable to verify what they actually are. To ensure your peace of mind, it could be a good idea to purchase insurance from a third party for your safety deposit box, just in case anything happens to it. If you would like to access your gold in a safety deposit box, it is also important to keep in mind the opening times of the bank, in the case of any sudden market movements, as the bank may be closed when this happens. However, for people with a few gold coins, keeping them in a safety deposit box in a bank can be a very good option. Many banks have stopped offering this service, as they do not like to have gold on the premises. The cost of storing your gold with Gold Investments could be significantly less than insuring it at home, plus there is less worry about having physical gold in your home. If you have purchased more than just a few gold coins and would like to keep them particularly secure, storing them in a gold vault may be a particularly good solution. Unlike a safety deposit box, you would not need to buy extra insurance for your gold, as it would already be protected by the vault. Storing your gold in a vault also allows you extra liquidity, as you can often buy, trade, and sell your gold from one location. In order to help keep your investment safe, each Gold Investment customer has the ability to use our storage options. Physical gold bars are kept at the London Silver Vaults at a cost of £4 per one oz of gold per year. Your gold will be segregated, as well as being fully insured and audited independently, giving you further peace of mind. A common solution to storing your gold investments is to split your asset into several storage areas. For example, you may choose to keep part in a safety deposit box, and another part in a vault, just for added security.